Schenkerian analysis meets Schoenberg Jackson Pollock, Lavender Mist (No. 1. 1950). For some reason, not everyone is able to appreciate the talent that goes into making something like this. Modern art and architecture is considered by many conservatives, such as Roger Scruton and Tom Wolfe, to represent a decline in standards from 'classical' art, which usually includes much of the Romantic period in their judgment. At first glance, these conservatives would appear to have a point. Compare the works of Renoir or the later works of Picasso to those of the nineteenth-century academic artists such as Jacques-Louis David or Jean-Léon Gérôme, and a decline in both craftsmanship and simple draftsmanship would appear to be present. Compared to the carefully rendered and idealized figures of the French academicians, Picasso and Renoir seem cartoonish and sketchy. The stereotypical rejoinder of incomprehension is that 'a child could draw that'. This judgment, however, is superficial, and fails to take into account the effects of technological change. As Clement Greenberg realized, despite the veneer of Marxist orthodoxy on display in his famous essay on Avant-Garde and Kitsch, the prestige of classical art was founded on the rarity of art objects, which enabled aristocratic patrons to control access to the unique items of beauty they owned. This scarcity was threatened by the rise of technologies such as photography, which enabled paintings to be reproduced with high accuracy, and which added the confidence of a purely mechanical process to portraiture; and lithography, which threatened to put near perfect copies of classic works of art on anybody's walls for pennies a print. In this technological environment, the snob appeal of classical art was threatened. Non-modernist art was often full of allusions and allegories of a type eschewed by modernists. New grounds for excluding the masses needed to be invented. Towards the end of the nineteenth century, with the rise of artistic modernism, one solution presented itself. Rarity and abstruseness of taste could be made to substitute for rarity of art objects since that horse had already left the barn. Subject matter and narrative -- historical figures, literary figures, idealized scenery or people -- were disdained. The critics thought that people liked pictorial art because it told a story. The subject matter was important to the masses. The theory held that people liked pictures and statues of George Washington and Jesus because they liked George Washington and Jesus. They looked at paintings of historical figures and traditional narratives from history or literature and liked the paintings because they brought those figures and narratives to mind. These popular approaches to popular art were arbitrarily judged as a lesser and imperfect form of appreciation. "Retiring from public altogether, the avant-garde poet or artist sought to maintain the high level of his art by both narrowing and raising it to the expression of an absolute in which all relativities and contradictions would either be resolved or be beside the point. 'Art for art's sake' and 'pure poetry' appear, and subject-matter or content becomes something to be avoided like the plague." What was needed to keep out the riff-raff was to make the art obscure, hermetic, and needing a complicated education and complicated explanations before it could be fully understood. Once scarcity of art objects was threatened, rarity of taste became de rigeur. This gave rise to works of art that could not be fully appreciated without background knowledge that only a few ladies and gentlemen of leisure could be bothered to acquire. A taste for such art meant that you were the kind of person with money and leisure enough to learn to like it. By this artifice, the snob appeal of art was saved.. This core belief of artistic modernity is itself problematic from the viewpoint of esthetic philosophy. You can jettison the literary, historical, and mythological references that informed classical and academic art. Understanding of these things, too, required knowledge; knowledge that was devalued by modernism. In order to keep contemporary art the bailiwick of an elite, the modernists succeeded only at replacing one kind of education needed to appreciate fine art with another. One result was an art world that was given to curious fads and phases, such as the odd concern with flatness that was thought quite important during much of the late 1950s and early 1960s. The heavy-handedly ironic movement of Pop Art flowed out of the flatness craze. Bringing back recognizable subjects, but with a nudge and a wink, the Pop artists offered depictions of objects like flags, comic strips, and soup labels that were inherently two-dimensional. 4.2 Was the CIA responsible? Dada was perhaps the first politically-inspired art movement, formed during the years of World War I, against war, bourgeois, nationalist and colonialist interests. Some of the more prominent members included Marcel Duchamp, Hugo Ball, Tristan Tzara, George Grosz, John Heartfield, Kurt Schwitters, and Max Ernst. George Grosz was later to be among the artists in the Nazi Degenerate Art Exhibition (see below). The Surrealist art movement grew directly out of Dadaism in the 1920s, including Dadaists André Breton, Marcel Duchamp, and Tristan Tzara. Surrealists drew inspiration from Marxism, Sigmund Freud, Pacific Island art (e.g., Joan Miró, and André Breton), as well as quantum physics (e.g., Wolfgang Paalen's "Figure Pandynamique") and Relativity (e.g., Salvador Dalí's "The Persistence of Memory"). Some of the other prominent Surrealists included Max Ernst, Man Ray, Luis Buñuel. Poster advertising the Nazi art exhibition of "degenerate" art. It is one of history's many ironies that the concept of "degenerate art" was introduced by a Jew and prominent early Zionist, Max Nordau . In 1892 Nordau published Entartung (English title, Degeneration.). Nordau based his hypothesis upon the theories about eugenics and forensic phrenology by the Italian criminologist Cesare Lombroso , whose The Criminal Man, published in 1876, attempted to prove that there were "born criminals" whose atavistic personality traits could be detected by scientifically measuring abnormal physical characteristics. From this basis, Nordau sought to criticize the modern art of his day as the result of similar processes of biological degeneration. A number of artists and literary figures, according to Nordau, had been so corrupted and enfeebled by modern life that they have lost the self-control needed to produce coherent works. He attacked Aestheticism in English literature and described the mysticism of the Symbolist movement in French literature as a product of mental pathology. Explaining the painterliness of Impressionism as the sign of a diseased visual cortex, he decried modern degeneracy while praising traditional German culture. The chief effect of Nordau's screed was to compile a pleasant anthology of some of the most interesting literary works from writers such as Gustave Flaubert, Charles Baudelaire, and Stephane Mallarmé; Nordau's ranting commentary about the degeneracy supposedly manifest in the masterpieces he anthologized only adds piquancy to the collection. Despite the fact that Nordau was Jewish and a key figure in the Zionist movement, his theory of artistic degeneracy would be seized upon by German National Socialists during the Weimar Republic as a rallying point for their anti-Semitic and racist demand for Aryan purity in art. Cover of the catalog of the Nazi "Degenerate Art" exhibition (1937). The work depicted is Der Neue Mensch by Otto Freundlich . In 1937, the Nazi regime ran an art exhibition of "degenerate art" , featuring works confiscated from the collections of several museums and from prominent Jews. The exhibition was organized by Adolf Ziegler , but the arbiter of what constituted 'degenerate art' was Hitler himself. The exhibition included work by a number of well-known artists, including Marc Chagall , Georg Grosz , Wassily Kandinsky , Ernst Ludwig Kirchner , Paul Klee , Georg Kolbe , Wilhelm Lehmbruck , Franz Marc , and Emil Nolde . These works were displayed accompanied and partially obscured by political slogans such as "Insolent mockery of the Divine under Centrist rule", "Revelation of the Jewish racial soul", "An insult to German womanhood", and "The ideal—cretin and whore". The event began in Munich but later went on tour to Dusseldorf, Berlin, Vienna, Weimar, and Salzburg. Many of the works displayed here were cynically sold off, to mostly American collectors, after the exhibition, although approximately 5,000 works were destroyed. Joseph Goebbels wrote of them changing hands between U.S. collectors for "ten cents a kilo", although some "foreign exchange ... will go into the pot for war expenses, and after the war will be devoted to the purchase of art." Some 1500 paintings were stolen by Hildebrand Gurlitt , an art dealer; the works were discovered squirreled away in his son's several apartments in 2012. “”If a planned social order is better than the accidental, irrational deposit of historical practice, two conclusions follow. Only those who have the scientific knowledge to discern and create this superior social order are fit to rule in the new age. Further, those who through retrograde ignorance refuse to yield to the scientific plan need to be educated to its benefits or else swept aside. This conflict between a self-proclaimed artistic elite and the masses has played out on a number of fronts. “”The contemporary cult of the free market is just as radical an exercise in social engineering as many experiments in economic planning tried in this century. Like other kinds of high modernism, it rests on a confident ignorance of the immensely complex workings of real societies. The Second Viennese School is a group of twentieth-century composers who sought to discard tonality in their music. After melodic centers insidiously slid back into their compositions despite their best attempts to exclude them (free atonality ), they devised the twelve tone row and the concept of musical serialism as algorithms whose purpose was to make sure those tonal centers did not sneak back in. Important composers associated with these movements include Arnold Schonberg , Anton Webern , and Alban Berg . It goes without saying that music composed by these methods seldom sends the audience out of the concert hall humming the tunes. Despite this, some products of the period, such as Berg's opera Wozzeck, have entered the standard repertoire. David Smith's Cubi VI, now at the Israel Museum. During the years after World War II, serialism and atonality became near ubiquitous in Western concert music, which at this point was no longer underwritten by paying audiences or aristocratic patrons but had become a wing of academia. Greenberg's contempt for the taste of the masses was made explicit by composer Milton Babbitt , who in 1958 published an essay given the title Who Cares If You Listen? in which he dismisses the tastes of his audience and praises the atonal and serialistic styles for their "efficiency". Babbitt himself, however, claimed that the title was changed from the tamer "the Composer as Specialist" to be more provocative, without his permission. From the 1950s through the 1970s, the academic serialist composers heaped scorn on their colleagues who dared to cling to tonality. Charles Wuorinen expressed a widely held view when he proclaimed that while "the tonal system, in an atrophied or vestigial form, is still used today in popular and commercial music, and even occasionally in the works of backward-looking serious composers, it is no longer employed by serious composers of the mainstream. It has been replaced or succeeded by the 12-tone system, first initiated by Schoenberg, subsequently developed into a world of chromaticism extending far beyond the domains originally envisioned for its use." In the Soviet Union, fortunately, some of the commissars were still proletarian enough that they would have none of this. Andrei Zhdanov , Central Committee secretary, published a manifesto denouncing "musical formalism" as "bourgeois", "imperialistic", and anti-democratic . These decrees cast a chill over the careers of Dmitri Shostakovich , whose opera The Lady Macbeth of the Mtsensk District was perceived as the offense that triggered the denunciation. Sergei Prokofiev and Aram Khachaturian were also whispered about as potential targets. The Communist party organized a special congress of composers where they were required to disclaim bourgeois formalism and adhere to socialist standards in music. The anti-formalist campaigns slacked off after Joseph Stalin's death in 1953; the composers were formally rehabilitated in 1958. However ham-fisted this government intervention in the creative process was, it had the result of making post-war Russian music much more listenable than contemporary productions of Western concert music. The Russian composers whose work was the target of the anti-formalism campaign went on to compose works of abiding popularity, such as Shostakovich's Fifth Symphony in D Minor. Of course, there were some composers outside the Soviet Union who resisted the strict taboo on classic tonality represented by strict dodecaphony; Copland wrote several pieces which, while based on tone rows, declined to rely solely upon the prime, inverse, retrograde, and retrograde inverse forms of those rows, and instead incorporated fragmented quotes thereof as a means of retaining more familiar harmonies. He also wrote unambiguously tonal pieces on and off until his death. Likewise, Vaughn Williams more or less stuck to his guns until his death (1958), although he did often defy expectations in other ways. While serialism certainly exerted a strong influence over some media/types of ensemble, the then-ascendant wind ensemble continued to develop a largely non-serial repertoire more or less unmolested, and in no area was serialism wholly dominant. Starting during the 1960s, other movements arose as well to escape the domineering strictures of Darmstädter serialism: examples include the minimalist style of Phillip Glass, Steve Reich and Terry Riley, the aleatoric and chance experiments of John Cage, and later, the spectral music of Gérard Grisey and Tristan Murail. By the 1980's, even a hardline serialist like Pierre Boulez had wearied of the rigors of hard serialism, and integrated the technique into a more fluid, expressive style. The revisionist historian Frances Stonor Saunders suggested, in her book The cultural cold war: the CIA and the world of arts and letters that the Central Intelligence Agency secretly funded many of the Abstract Expressionist painters, serialist composers, and other modern artists in the post-war United States. Via the Congress for Cultural Freedom , the CIA encouraged these artists as a rejoinder to the political orthodoxies of Socialist Realism and the persecution of avant-garde artists by Communist bureaucrats. According to Saunders, the idea was to win the hearts and minds of the Western intelligentsia that followed these issues and turn them into intellectual allies in the Cold War and the struggle against Soviet communism. By publicizing the American artists' freedom to create drippy action paintings, atonal music, and other abstract arts free from any moral or political message, they meant to contrast the artistic vigor and freedom of the West versus political interference by Stalinist bureaucrats. This really was a job that called for double-naught spies. A public State Department exhibition of modernist American art drew political blowback, with President Harry Truman scornfully remarking, "If that's art, then I'm a Hottentot." In this climate, the message that America was a land of cultural vitality and friendly to intellectuals would need to be publicized by clandestine means. The newly formed CIA, staffed with young graduates of elite Ivy League colleges, was better suited for this mission than other agencies of the United States government. Nelson Rockefeller and other members of the Rockefeller family were alleged to have been the conduits of CIA patronage, via their seats on the board of the Museum of Modern Art and other cultural institutions. Others have dismissed this suggestion as a conspiracy theory. Michael Kimmelman has argued that these allegations are either flatly false or at minimum decontextualized. And to some, like Henry Makow, it really was a conspiracy. The CIA was sponsoring abstract art on behalf of the Illuminati, who used abstract art to corrupt our moral fiber. "Modernism is a solipsism where the bankers' perversity becomes the norm. For example, the CIA actively promoted modern abstract art, an art disconnected from human identity and aspirations, an art any child or monkey could produce." The right-angled desert canyon of New York's Sixth Avenue. During the postwar twentieth century, architects were seriously into rectangles. Bad architecture has a problem. If you don't get serialist or atonal music, you don't have to listen to it. Odds are your classical FM station doesn't play much of it anyways. If you find the abstract expressionist action paintings of Jackson Pollock incoherent daubs, nobody is forcing you to look at them. But the bad, sterile architecture that characterized the post-WWII twentieth century was unavoidably in your face. This style was called the International Style , largely because architects planted the same concrete, steel, and glass boxes everywhere, without regard to the surrounding buildings or traditions established by the availability of local materials. And due to the extreme dominance of the style in the architectural community, soon building materials other than concrete, steel, and glass became too costly or unavailable. Leftist Bauhaus architecture: dormitories of the Bauhaus in Dessau, Germany, 1925. Note the use of rectangles. Right-wing Fascist architecture: the Casa del Fascio in Como, Italy, 1932 - 1936. Notice the difference? I didn't either. The International Style, like serialist music, arose in pre-war Germany and was fostered in the Bauhaus by Walter Gropius . As the Nazis began to rise to power in 1930s Germany, many Jewish teachers and students from the Bauhaus fled, many to British Palestine, where they built the White City of Tel Aviv in the Bauhaus style. “”The object of this edict is to enlighten the present and future citizens of Chandigarh about the basic concepts of planning of the city so that they become its guardians and save it from whims of individuals. Grand claims were made for his vision; he said that his design for the city "puts us in touch with the infinite cosmos and nature. It provides us with places and buildings for all human activities by which the citizens can live a full and harmonious life. Here the radiance of nature and heart are within our reach." Le Corbusier went on to collaborate with the Vichy regime of France during World War II, while also asking Mussolini to put him in charge of something radiant. “”Nothing dates faster than people's fantasies about the future. This is what you get when perfectly decent, intelligent, and talented men start thinking in terms of space rather than place; and single rather than multiple meanings. It's what you get when you design for political aspirations rather than real human needs. You get miles of jerry-built platonic nowhere infested with Volkswagens. This, one may fervently hope, is the last experiment of its kind. The utopian buck stops here. —Robert Hughes, The Shock of the New, ep. 4, "Trouble in Utopia". “”The disorienting quality of Brasilia is exacerbated by architectural repetition and uniformity. Here is a case where what seems like rationality and legibility to those working in administration and urban services seems like mystifying disorder for the ordinary residents who must navigate the city. Brasilia has few landmarks. Each commercial quarter or superquadra cluster looks roughly like any other. The sectors of the city are designated by an elaborate set of acronyms and abbreviations that are nearly impossible to master, except from the global logic of the center. The Plaza of the Three Powers in Brasilia . On the left, the Brazilian Supreme Court; the two towers are the legislative buildings, and on the right are the executive offices. This vast paved area was built in a semi-arid tropical savannah climate. No one is dumb enough to venture far into its shadeless expanse of white concrete. The brutality of Brutalism: the Hubert H. Humphrey Building in Washington, DC. Currently occupied by The Ministry of Love Health and Human Services. The Pruitt-Igoe tenements in St. Louis, Missouri, before their demolition. They were designed by Minoru Yamasaki , who also designed the World Trade Center in New York. The International Style, particularly in its later Brutalist  manifestations, is one of the most generally disliked art styles of history. It is routinely described as ugly, inhuman, sterile, and elitist. Non-fans include Charles, Prince of Wales, who remarked "You have to give this much to the Luftwaffe. When it knocked down our buildings, it didn't replace them with anything more offensive than rubble." It is indelibly associated with large corporate clients and government projects. Its most disliked manifestations tended to be the residential buildings built during the heyday of "urban renewal" and slum clearances during the 1960s and 1970s. As Jane Jacobs has pointed out in The Death and Life of Great American Cities , "slum" neighborhoods often were in fact working neighborhoods, with residents living above streets whose ground floors were full of small businesses. These environments fostered community, of a sort; though the residents may have been poor, the unplanned nature of the neighborhoods and the mix of residential and commercial use put "eyes on the street". Sidewalks and public areas were easily visible and accessible to some subset of the residents. Shopkeepers and residents could intervene in case of trouble. In a healthy urban poor neighborhood, communities took some of the burdens of keeping order off the shoulders of police and other authorities. The urban planners, confident that their expertise was superior to that of the poor people who lived there, swept away these tenements and removed their residents into vast International Style high-rises. These projects were designed for privacy with hardly any visible public spaces. They were deliberately and intentionally separated from grocers, small restaurants and taverns, and other small businesses that formed part of the former urban mix. Moving the urban poor into these warrens often brought an epidemic of crime, like the ones that befell the notorious Cabrini–Green Homes in Chicago, and the Pruitt–Igoe housing development in St. Louis. Tom Wolfe was generally correct when he wrote in From Bauhaus to Our House that large blank concrete constructions are alienating, and architects need to take into account the people who live and work in the buildings they design. Wolfe's book became a standard text in architecture courses, to discourage architects from repeating the mistakes they were making. It didn't work. With the passage of time, some Brutalist buildings have actually become popular with the people who live or work in them, and many are now regarded as spectacularly photogenic, leading to a revival of interest in the style. Mike Harman, The cultural Cold War: corporate and state intervention in the arts; libcom.org, Sept. 11, 2006. Alleges that the CIA funded serialist composers and abstract impressionist painters as part of an anti-Communist strategy. James C. Scott, The Trouble with the View from Above. Cato Unbound, Sept. 8, 2010. Abstract expressionism , only this time by a chimpanzee. ↑ Here, for instance, Pierrot paints a picture of history's first royal gay wedding, apparently between two lesbians. They have weird pets. His canvas is held up by naked Hercules. To his right, a flying babe beats up a Roman soldier while being urged on by a second flying babe with a vuvuzela. Above, the Pope is hangin' with his baby mommas, drinkin' that wine. To the left, Lady Liberty shows off her legs to George Washington, who hugs his wild boar(?) in alarm, above another sadomasochistic scene, this time with cherubs. Let us see, for example, what happens when an ignorant Russian peasant ... stands with hypothetical freedom of choice before two paintings, one by Picasso, the other by Repin. In the first he sees, let us say, a play of lines, colors and spaces that represent a woman. The abstract technique ... reminds him somewhat of the icons he has left behind him in the village, and he feels the attraction of the familiar. 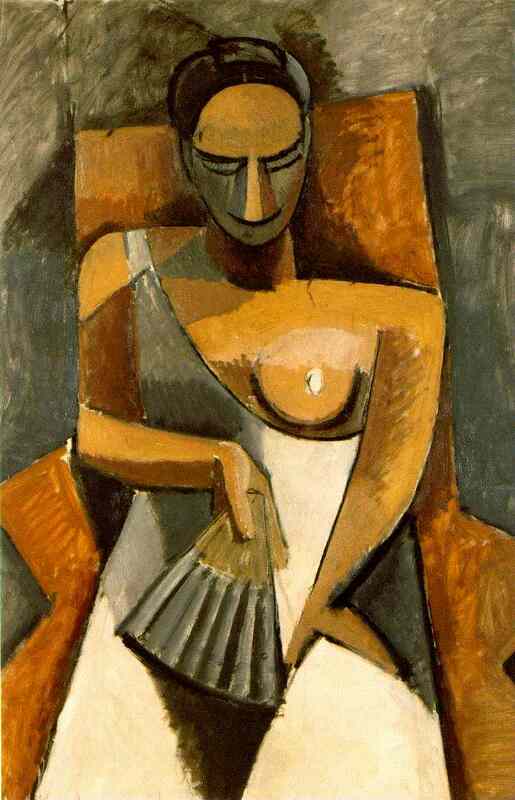 We will even suppose that he faintly surmises some of the great art values the cultivated find in Picasso. He turns next to Repin's picture and sees a battle scene. The technique is not so familiar -- as technique. But that weighs very little with the peasant, for he suddenly discovers values in Repin's picture that seem far superior to the values he has been accustomed to find in icon art; and the unfamiliar itself is one of the sources of those values: the values of the vividly recognizable, the miraculous and the sympathetic. In Repin's picture the peasant recognizes and sees things in the way in which he recognizes and sees things outside of pictures -- there is no discontinuity between art and life, no need to accept a convention and say to oneself, that icon represents Jesus because it intends to represent Jesus, even if it does not remind me very much of a man. That Repin can paint so realistically that identifications are self-evident immediately and without any effort on the part of the spectator -- that is miraculous. The peasant is also pleased by the wealth of self-evident meanings which he finds in the picture: "it tells a story." Picasso and the icons are so austere and barren in comparison. What is more, Repin heightens reality and makes it dramatic: sunset, exploding shells, running and falling men. There is no longer any question of Picasso or icons. Repin is what the peasant wants, and nothing else but Repin. It is lucky, however, for Repin that the peasant is protected from the products of American capitalism, for he would not stand a chance next to a Saturday Evening Post cover by Norman Rockwell. The argument would appear to be based on sneering at 'peasants', scoffing at our imaginary peasant's actually intelligent response to the two paintings, and assuming that the reader shares Greenberg's disdain for the art of Norman Rockwell. ↑ Richter, Hans (1965) Dada: Art and Anti-art, Oxford University Press. ISBN 0500200394. ↑ Surrealism, Art and Modern Science: Relativity, Quantum Mechanics, Epistemology by Gavin Parkinson, Yale University Press, 2008, 294 pp. ISBN 9780300098877. ↑ [http://www.surrealismcentre.ac.uk/papersofsurrealism/journal8/acrobat%20files/Book%20Reviews/Ambrosio%20final%2017.05.10.pdf A review of Surrealism, Art and Modern Science by Chiara Ambrosio (2010). ↑ Max Nordau, Degeneration. English translation, 1895. ↑ Lombroso and Nordau accepted the social Darwinist hypotheses of Ernst Haeckel, who held that 'ontology recapitulates phylogeny' -- which is to say that every organism passes through the evolutionary states of its ancestors in the process of being born and maturing. Haeckel's theory raised the prospect that some people get stuck on an earlier stage of development and become 'atavistic' evolutionary throwbacks. Sigmund Freud's theories about psychosexual development also owe much to Haeckel's goal-driven view of evolution. ↑ Frederic Spotts, 2002. Hitler and the Power of Aesthetics. The Overlook Press. pp. 151–68. ISBN 1-58567-507-5. ↑ Deniz Tekiner, Formalist art criticism and the politics of meaning. Social Justice, Jun 22, 2006. ↑ Interview with Bram Dijkstra, conducted by Ron Hogan, for beatrice.com. ↑ Anthony Tommasini, Midcentury Serialists: The Bullies or the Besieged?. New York Times, July 9, 2000. ↑ Charles Wuorinen, String Quartet No. 1, 1971. ↑ Dmitri Shostakovich, Passacaglia from The Lady Macbeth of the Mtsensk District (Леди Макбет Мценского уезда), 1934. ↑ Listen, for example, to his Piano Fantasy, which he himself argued could be described as having an "over-all tonal orientation" despite "liberal use of devices associated with that [twelve-tone] technique." ↑ 22.0 22.1 Frances Stonor Saunders, Modern art was CIA 'weapon', The Independent, Oct. 22, 1996. ↑ Michael Kimmelman, in Frascina, Francis, ed. (2000). "Revisiting the Revisionists: The Modern, Its Critics, and the Cold War". Pollock and After: The Critical Debate. Psychology Press. pp. 294–306. ISBN 9780415228664. ↑ Is this an antisemitic dog whistle or are we already seeing things? ↑ Henry Makow, How the Illuminati Control Culture, October 6, 2013. ↑ Indiana once had an industry of skilled stone cutters and carvers carving Corinthian capitals and other architectural details out of the celebrated Bedford limestone. When the use of classical decorative elements in architecture fell out of fashion, these skilled artisan jobs vanished. Walter S. Arnold, History of the Stonecutter's Union; See the Wikipedia article on Indiana Limestone. ↑ Jonathan Glancey, Life after carbuncles, The Guardian, May 17, 2004. ↑ Why Brutalist Architecture Is So Hard to Love by Roman Mars (99% Invisible) (Aug. 13 2015 9:27 AM) Slate. This page was last modified on 31 October 2018, at 15:39.